Seneca's rival in the record cold department in the early part of the 20th century was the railroad town of Meacham, situated in a shallow mountain valley bottoming out at 3,670 feet altitude. It's beautiful valley is right on the Union Pacific rail line, high in the Blue Mountains, midway between LaGrande and Pendleton. Since Meacham was such a well-known passenger railroad stop in the first half of the twentieth century, its fierce winters were often reported by The Oregonian in Portland, the State's main newspaper, but Seneca's weather conditions were rarely mentioned---- In the 1930's, for example, Seneca had set Oregon's all-time record low in 1933, but most Oregon citizens did not know it, and continued to believe the Oregonian's reportage in February of 1933 that Meacham had set the State's all time record, an amazing 52 below zero. But Seneca had been 54 below zero! *Please go to the bottom of this page for a technical explanation of why both Meacham and Seneca can get so much colder than anywhere else! gave the town its present name. migration of 1843 (The Oregon Trail)." These days, Meacham is a sleepy little hamlet close to InterState 84 freeway, but enough out of sight that it has slid from the prominence it once had in the Log Cabin restaurant days. And it has also slid from prominence in the record cold department since the moving of its official weather station onto a plateau SE of town, and 400 feet higher. Now, Meacham's station reports just average, mediocre temperatures. Why did moving the station make such a big difference? The reason is cold air pooling, the phenomenon that makes Seneca so incredibly cold has been stolen away from Meacham by moving its thermometer out of the cold air pool beside Meacham Creek, and putting it up onto the plateau with good air drainage! 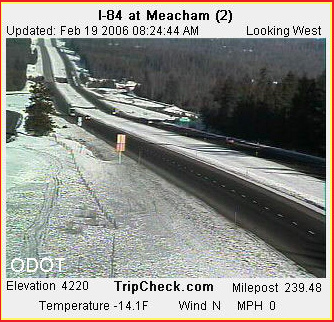 * Technical climatology: Why does Meacham (the town proper, not the airport) get so cold? ---- Just like Seneca, the town of Meacham sits at the very lowest end of a cold air sink in a high mountain valley. Above town, a series of draws funnel cold air downward from hills rising to about 600 feet higher than town. Just like what happens in Seneca's valley, the town of Meacham is at the confluence of several creeks---Two Mile, Beaver, Meacham, and Tod Creek, all of which funnel cold nightime air downward to stagnate. Just beyond the town, the sink ends as the basin abruptly narrows and Meacham Creek exits through a narrow canyon, exactly like the Silvies River does at Seneca. Although Meacham's small mountain valley is "less" than Seneca's in most respects, it has powerful potential to collect cold air, stagnate it, and magnify coldness night after night until storm front winds can reach deep enough to scour out the cold air. That's how Meacham was able to generate occasional state-record cold that was very close to Seneca's. When the Weather Service moved the official weather station to a free-draining hilltop plateau, one of Frontier Oregon's "Arctic Kings" bit the dust. Consider what was written on this page its requiem. 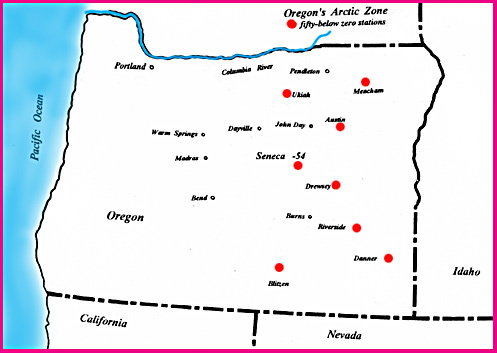 Bruce's Map of Arctic Oregon's eight populated places where it has been 50 below zero or worse. From north to south-- Meacham, Ukiah, Austin, Seneca, Drewsey, Riverside, Danner and Blitzen....This map is copyright 2008 by Bruce B. Johnson. Ukiah lies closest to Pendleton, and is about 36 air miles south of Pendleton... It, like Seneca, is a tiny incorporated town. 260 folks live in Ukiah. Ukiah is just 68 air miles north of Oregon's Arctic King, Seneca, but it is nearly 1,400 feet lower in elevantion, at only 3353 ft. elevation.... Ukiah is surrounded by the rolling uplands of the Blue Mountains, which rise to about 5500 ft. within 15 miles of town...The North Fork of the John Day Wilderness area lies just to the SSE, over the crest of the drainage between Cable Creek and Winom Creek. Like Seneca, Ukiah occupies the lower end of a broad valley encircled by mountains. Many creeks converge in this valley, (Camas Creek, Cable Creek, and Owens Creek being the main ones), and all exit through one narrow gorge just south of the town of Ukiah-- exactly like the constricted river exit at Seneca that helps create Seneca's cold air dam. On calm, stagnant nights, metaphorical "rivers and creeks" of cold air pour downhill and fill Ukiah's valley, helping to feed the stagnating cool air pool in the valley floor, producing extreme cold... a similar situation exists in Pine Valley, where Arctic Queen Halfway lies (see below). A note about Arctic King Blitzen (German for "lightning"). This tiny pioneer farming/ranching town was a true Arctic monster in the early 1900s, beginning somewhere about 1917. It recorded 40 below in 1917, 47 below in 1919's massive arctic outbreak, and a bone-breaking 50 below zero on January 21 of 1930... Topographically, the reason this bare-boned excuse for a town got so cold is not obvious. Unlike Seneca, Meacham or Ukiah with their deep valleys with obvious cold-air damming, Blitzen sat far out on a broad and rather bare plain called the Catlow Valley, which in the Ice Ages times held a giant pluvial lake of 351 square miles and a depth of 70 feet.... While Blitzen's 4530 foot elevation gave it the high altitude that one might expect from a site producing such extreme minimums, where was the air stagnation and cold air pooling? My theory is derived from examining the topographic maps. Blitzen sat near the bottom of an ancient lake bed, and at a distance of 10-20 miles high mountains rise, especially to the southwest, south, and east. On the east is the main range of the Steens Mountain, up to over 9,000 feet, while to the south the land rises to as much as 7900 feet at Beatty's Butte, and to the southwest rises the mass of 8000 foot Hart Mountain. So there are good sources of cold air drainage, while the dry high desert air facilitates radiative cooling at night. By the way, Blitzen has long since been a ghost town, and most recently is not only on private land, but is now so deteriorated that there's hardly anything even standing anymore. Good riddance, some would say, because the climate at Blitzen was BRUTAL-- dry, dusty, extreme cold in the long winters, but also capable of terrible summer heat, such as 113 degrees on June 28, 1932. Halfway, Oregon is a tiny town of about 350 people on the far eastern fringe of Oregon, more or less east of Baker. It is very remote. Despite the fact that it lies a full 2,000 feet lower than Seneca, it is a very strong cold air sink under the right set of circumstances. Halfway gets my nod as an "Arctic Queen," and holds two amazing cold records in my record book. By way of introduction, an "Arctic Queen" is a location that has historically set an impressive cold weather record, but which is typically not in the same league with the cold weather giants like Seneca or Ukiah. In fact, except for the occasional severe winter cold snap, Halfway has a very wonderful climate in my way of looking at such things (four distinct season, lots of sunshine year-round, typically dry, clear, clean air). It rests in a knock-out gorgeous location on the southeastern flanks of the mighty Wallowa Mountain range, and if that weren't enough, it's a half hour drive down to the Hells Canyon National Recreation Area at Oxbow Dam on the Snake River.. Heard of Cornucopia? Just go up Pine Creek from town for about 12 miles, climbing 2,000 feet, and you're at Cornucopia, one of Oregon's most renowned historic mining towns. Hike up canyon further, and you'll reach 9,555 foot Red Mountain and pass on over into the Eagle Cap Wildernes Area. Want to get back to Civilized Parts? It's about 40 miles west on Highway 86 to get to I-84 Freeway and Amtrak, where you can head down to big-city Boise, Idaho. Click here to visit my detailed coverage of Halfway's record-setting cold spell that lasted nearly two full months, from December 16, 1948 to February 2, 1949. Temperatures went down to 34 below zero and nightly lows stayed well below zero nearly this entire time! There were two Oregon all-time records set during this cold spell! 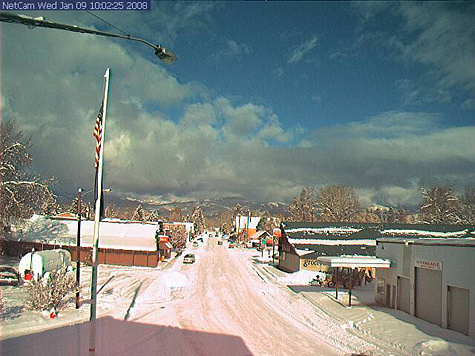 Here's the link to an excellent current webcam looking up Main St. of Halfway toward the Wallowa Mountains: http://halfwaycam.dyndns.org/... the picture to the left is from that webcam on a snowy winter day such as I imagine it looked like during the severe arctic spell of 1948-49. Possible New Addition to Oregon's Arctic Kings-- the Crane Prarie Remote Recording Station-- Oregon's New All-Time Coldest Spot? Crane Prarie may just be the coldest reporting station in the State of Oregon, colder even than Seneca. To count it in, of course, we have to accept that it is not a place where there is any kind of year-round human presence, much less a true town or city. Station Location: in the headwaters of the Malheur River, about 25 air miles east of Seneca.... On the southern side of the Strawberry Mountains, just like Seneca ..... Elevation: 5,500 ft., GPS coordinates, 44.1667 by 118.4667, NWS station code = CPF03. The coordinates place the station somewhere on the north edge of Crane Prarie, which is a small, open grassland with Crane Creek running through it.... The terrain is surrounded by mountains, with only a small, constricted exit where the creek leaves, a perfect cold air dam situation, just like Seneca, Ukiah and Meacham, but higher altitude than any of them... In fact, the northern edge of the prarie rises steadily right up to a 7, 041 ft. peak in only 3 miles. Based on a quite limited but exciting sample of winter data (see below), it seems quite probable that Crane Prarie has the potential to exceed 60 below zero. In fact, it is likely that Crane Prarie can become a renowed Oregon cousin to Utah's famous Peter Sink, which has reached 69 below zero (Feb. 1, 1985). Peter Sink is estimated by computer modeling to have the potential of 82 below zero! Peter Sink hides in the mountains above Logan, Utah, in Cache County. This Utah "sink" is small in size, only about one mile long by half a mile wide, and shallow, a depression only 210 feet deep forming its cold pool collecting area..... when measured against the dimensions of Crane Prarie, it turns out that Peter Sink is only half as big as Crane Prarie! During a recent mid-February spell of seasonable winter weather, Crane Prarie was consistently much colder than Seneca. Comparison values for Oregon's coldest major town (Burns), and also for John Day and Portland are included. The time period chosen was one in which Portland reached it coldest temperature for Winter 2004-2005. This Feb. 14-17 time period also featured the presence of the type of multi-day stagnating clear conditions that always produce Oregon's record coldest temperatures. Following this first data is additional data from two weeks later. The data above also illustrate how the first two weeks of February are often the time period during which Oregon will experience it lowest temperature for the winter-- remember, for instance, that both Oregon's all time record low, and Portland's record low, were set during February. Click here for a similar example from Winter 2005-2006's most severe Cold Wave. By the beginning of March, odds have become miniscule of Oregon having a major arctic air invasion.... In the Willamette Valley, it is typically a time of high pollen as most trees and bushes are putting on blossoms and buds are breaking. Bulbs are in full swing..... but in the high valleys of Eastern Oregon, even during just average weather, the heavy frosts continue.... The data below will include "Cold Springs," a new "Cold Champ" candidate, which is located much closer to Oregon's population centers than either Seneca or Crane Prarie.... "Cold Springs" is located about one hour's drive east of Prineville, in Big Summit Prarie, close to the annual meeting place of the Oregon Star Party (which is a BIG event, drawing 700-800 serious amateur astronomers). Below you will find the Average daily low temperatures at four different Eastern Oregon stations, February 24 through March 3, 2005 (note: Feb. 28 lows were not included as a push of warm, cloudy weather affected Eastern Oregon briefly, producing a very unusual warm night, so the data set consisted of the other seven days). Seneca, 4665 ft., average low was a very brisk 18.0, with lowest of 13 degrees... Seneca's holds Oregon's all-time record coldest mark of 54 below zero. Cold Springs, 4695 ft., average low was a frosty 16.1, with lowest of 7 degrees.... This is quite significantly colder than Seneca. Crane Prarie, 5499 ft., average low was a chilling 11.3, with lowest of 6 degrees.... Crane Prarie looks like it is probably Oregon's true Cold Champion. Update: March 31, 2005 low temperatures: Crane Prarie 9 degrees, Seneca 16, Burns 20, and Cold Springs 19. The theorized cold sink pattern appears to be consistent. Halfway is in a valley about 5 miles wide by 7 miles long. At the upper end is Carson, elev. 3,400, about midway is Jimtown aka Langrell, near the bottom are Pine and Halfway itself...follow Pine Creek down to the Snake River and you are at Trail Park and Hunsaker Creek. Brownlee Dam is nearby, as is Richland and Huntington, one of Oregon's hottest towns. The famous Cornucopia mining district had many different mines, some names include the Amalgamated Mine, the Know Good Mine, the Queen of the West Mine, the Baker Mines Company leased the Last Chance Mine from the Cornucopia Mines Company in 1913. There were at least two major tunnels in the zone, the Lawrence Tunnel and the Clark Tunnel.....The Jim Fiske Creek joins Pine Creek here, and the Jim Fiske Trail heads upward toward Cornucopia Peak at 8543. The West Fork of Pine Creek heads at Pine Lakes 7,560 feet elevation. Halfway has a fairgrounds and also a Baker County Library. Also there is a bed and breakfast whose name might be Clear Creek Inn, I forget, but also there is Pine Valley Lodge. Chief Joseph and the Nez Perce reputedly had a home in the Pine Valley in the 1850s. The cold winter climate in the Wallowas leads to their being a training site for the famous Alaskan sled dog race, the Idiarod or Idiatrod, in Northeastern Oregon the training race is held annually in January and is called the Eagle Cap Sled Dog Race, one end of which is anchored at the upper end of Pine Valley.